Let's face it, no one wins every Opportunity. Though it can be tough to watch a Project slip away, this missed Opportunity can still bear fruit. When an Opportunity is lost, Cloud allows you to capture why so you can refer back to this information over time and evaluate trends to help identify ways improve your close ratio. When your account is created it is populated with a number of lost reasons. These reasons serve as a way of categorizing why an Opportunity was lost. 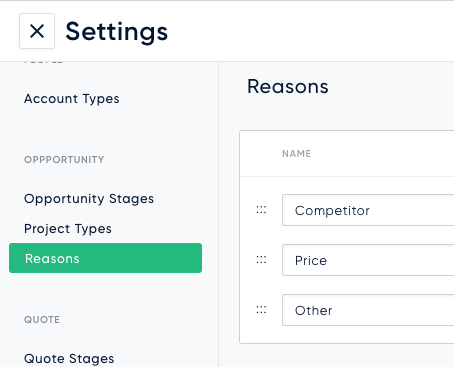 You can personalize this list of reasons in Settings under Opportunity. The person who marks the Opportunity as "Lost" will be prompted to select one of the reasons and can optionally include a brief description to provide more context.